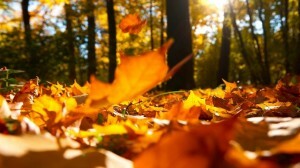 Falling leaves begin to litter the ground. Beginning in 1990, three studies have been conducted at Michigan State University’s Hancock Turfgrass Research Center to examine the feasibility of mulching tree leaves into existing turfgrass canopies. The first study examined different deciduous leaf rates (50 and 100 pounds of dry leaves per 1,000 sq. ft.) and the timing of nitrogen fertility applications. The objectives were to determine if there were any negative effects of mulching tree leaves into the existing canopy with a lawn mower and if the nitrogen fertility would enhance leaf-litter decomposition. The study ended in 1996, concluding that there were no negative effects of mulching the leaves into the turf at the rates applied and that the nitrogen treatments did not aid in the degradation of the leaf litter. Un-mulched leaf in the later stages of decomposition.